Is text-only enough for today's students? After an amazing trip to CNN this week, I have been thinking about how we tell stories as educators and how we teach students to tell stories. So, I'm going to give you a little quiz. 1. Which tells the story the most clearly? "This past spring we lost 11,000 pecan trees in a terrible tornado that ripped right through the grove." 2. Which tells the story more clearly? A little girl was playing a game and a face jumped out at her. 3. Which tells the story more clearly? Parodies of Harry Potter Films are cropping up all over the Internet. 4. Which tells the story more clearly? St. Charles avenue was ready for the parade. This panorama (click on the photo). 5. Which tells the story more clearly? The United States is excitedly showing school spirit this fall. 6. Which tells the story more clearly? We kicked off the flat classroom project today with an interesting discussion about communications. 7. Which is more effective in a Math class. Geometric Formulas are used in everyday life. Any of the photos at http://flickr.com/photos/tags/pc30sf06/ (be sure to blow them up and look at the clickable areas.) I particularly like this one from Darren Kuropatwa's Math class. And those narratives aren't always using text -- but rather, video, audio, pictures, and other formats. Do we need more than text to tell the stories? Here is the point. There are so many new ways to tell stories. Are we as teachers teaching kids ONLY to read and write and is that enough? "We look at what we're trying to say and then we decide the best medium to tell the story." Text was only one of 12 choices. So, I ask, is text enough? I believe we should encourage students to select the best mode of communicating their topic. And that students should be familiar with as many modes as possible. Sure, someone has to put these in their "toolbox" but once the tools are there, they should be using them in all classes. I think we're too hung up on the technology and not realizing that we are experiencing an evolution in how humans communicate. Text is still important and synchronous communication is too -- but asychronous, non-text based communication is increasing in importance in our society without a correlating increase in the classroom. Their voice, their graphics, their face, and their typed text all play a role in their future as a communicator in this electronic world. There is a cool new way to add audio to your slideshare. This slidecast shows you how. 3- Upload your mp3 file anywhere you have the license to -- it can be archive.org, podomatic.com, or even your ning. 4- Go in and click edit slide show. So cool. Yes, there are multiple steps, but after it is done, this is a great artifact to embed on a wiki or even your school website to demonstrate the work of students. It would be EXCELLENT to have students or teachers submit their work via slideshare as their end of year portfolio. WOW! Session—one hour long unless otherwise specified; meeting room has a formal presentation station and a seated audience. There are 13 one-hour session time slots during the three-day conference with multiple sessions occurring concurrently. Lecture—one or more presenters, each of whom address the audience independently. Content should be of high interest and widely applicable to the broader NECC audience. Content should educate, inspire, challenge, and/or provide specific implementation ideas. The focus should be on evaluation and synthesis rather than the history/details of a specific project or initiative. Panel—main presenter serves as moderator for his/her co-presenter panelists. Content should lend itself to a variety of perspectives with the moderator focused on creating a cohesive presentation. Model Lesson (in a Model Classroom)—requires 2 presenters. First teaches an actual lesson to 20 attendees playing role of students. Second acts as emcee, simultaneously explaining the lesson and the classroom management/instructional strategies being implemented to the remainder of attendees observing. Content should demonstrate taking advantage of technology and the latest learning theories such as project-based learning and differentiated instruction. Open Source Lab—teach, show, or demonstrate open source software in an environment of thin client, Linux-based machines for individual exploration and practice. IVC Showcase—30-minute presentations by interactive videoconferencing (IVC) leaders and innovators showcasing their programming content and classroom initiatives via videoconferencing from their home locations. IVC showcase means that any of you reading this post can present. So, throw your excuse or pity parties away and submit a proposal right now. They are due October 3! In the Invent this project, my students are . But, I thought I'd share with you a few of their "inventions" which are just so cool. Turns your cell phone into your webcam, makes skype calls (instead of cell) while on your computer), synchs everything, shares everything -- becomes your one-stop peripheral device and storage and is inserted through a USB cradle on the top of your monitor. So Cool! Adding a keypad and a wireless ability to directly upload photos from your memory stick to Flickr (freeing up space) as you are using the camera is a pretty cool idea. Combining Microsoft Surface, holograms, and a bank of perfume scents, people can talk to their favorite celebrity about perfume choices and even customize their perfume selection to have it delivered. We've learned many things -- convergence, copyright (creative commons photos used), photography, graphics development, PhotoShop, PowerPoint, animoto, marketing, and embedding things on blogs -- so many concepts were embedded in this project it would be tough to list them all. Students are great inventors -- there are many other ideas I may share soon. I hope you'll leave feedback here that I'll share with my students about their inventions. Unfortunately, the embed feature for these videos isn't working in our wikispace, when it begins to work, I'll share the page. Note: This is part of my process of incorporating the senses of the Conceptual Age from Dan Pink's book A Whole New Mind into my teaching. Students are told what to do... they need to invent, create, and explore. Our world needs them to invent create and explore. I went very quiet for a while during the last two months, and now I am at liberty to say why. 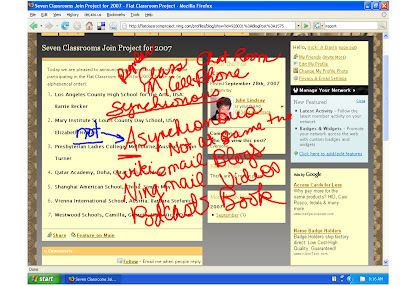 When Atomic Learning first approached me about doing a Web 2.0 workshop for them, I had to think about it. I've been doing some free videos that have been well received and I thought, "well, I need to do it and just give it away for free." And at the time, I thought about doing some of these for Julie's and my proposed K12 online workshop ... but then k12 online rejected the workshop and I realized something... without a deadline and purpose to make me take the time... I really wasn't going to take the time do to a workshop, so I said yes. So, this weekend Atomic Learning releases the Web 2.0 workshop that I've poured my heart and soul into. It is a workshop targeted to beginners who are teachers, administrators (and some for businesses) and it covers all Web 2.0 terminology and RSS basics. I feel that Atomic meshes well with my own philosophy and has been created by teachers and with the academic market specifically in mind. So, if you have Atomic Learning and want to view the workshops, just log in and go to this page. This blog and so many things I do will remain free. However, I am also one who believes that well intentioned businesses who want to meet a specific niche will always have a place in this world. And they serve the purpose to focus and make us do things sometimes. So, while I rarely give "pitches" or talk about such things, I hope you'll stop by and take the course if you have Atomic Learning -- feel free to give me feedback on the things you'd like to see relating to Web 2.0 in the future. This whole thought of being able to teach "around the world" is really amazing to me. I was in Qatar with Julie and didn't even know it! Right now I am blogging from the eleventh floor in the Omni Hotel in Atlanta where two students and I will soon be settling down for a little rest and perhaps a few giggles after a great day. Tomorrow, we are going on a VIP tour of CNN where we will learn first hand how they are integrating citizen journalism, podcasting, and social media into their work to break, make, and share the news around the world. My students have been researching the reporters we will be meeting tomorrow and presented to the class last week using Google presentations. Of the most interest to me was iReport, the citizen journalism arm of CNN that allows anyone to submit the news with the potential that it may be run on CNN. I find it fascinating that our society has come to this. You or I, cell phone or camera in hand, can witness something and have our video on the evening news. It is a matter of place and connection. This is a place in which things which happen come to light much more quickly and graphically than ever before and liars are increasingly finding it harder to hide. Additionally, it is a place where we are also less likely to be allowed to make mistakes, either -- when one lapse of judgment or a bad day could literally ruin the rest of our lives as our mistake is shown throughout the world. I don't know if we comprehend or are ready to live in a world such as this... where every citizen is a journalist. For do citizens naturally know the ethics of what they do? Or do we understand that just because we can doesn't mean we should? I will be fascinated to see how a professional, ethical news organization grapples with such issues as they bring citizen journalism into main stream media. Today has been a great day -- we came up early to see the Atlanta Braves win against Milwaukee Brewers 7-4 (and even saw their manager ejected.) We enjoyed Bison at Ted's Montana Grill and my students frolicked in the Olympic Fountain. It was truly a most memorable, exciting, and fun day. I have a purpose and objective here, but sometimes, letting students sniff the fragrant air and inhale the scent of life itself is truly rewarding. Now, I shall lean back and inhale and tomorrow we shall learn. And yet, somehow, I think we've been doing that all day. Talk about a mess! The blog post from a couple of days a go made my feed size exceed feedburners 512K limit and my feed went completely down! Try as I may, the only way to fix this was to go back and remove the lengthy transcript from the post. So, now my feedburner count is down to ZERO -- (talk about giving a blogger a complex) - but the count restarts every day and should be back to "normal" in a couple of days. I'm sorry if this caused any problems in your readers! I'm still here! I don't have time for this today -- I started with no readers and really it is about the conversations and how it helps my own classroom. Meanwhile, I'll look at my zero readers and count it as a dose of humility that I and all bloggers need who would overinflate the importance of it all. I was pulled into Dean Shareski's phenomenal post PLC's Something's Missing. "...they even reference rigorous standards and I think I heard the term 21st century learning (whatever that really is), I’m still fearful that the zeal to improve scores and test results leads to the perpetuation of school as we knew it and still know it. The strategies of PLC’s and assessment, if not combined with a real understanding of what kids ought to be doing in school leave use just doing a better job of the schools of the 1950’s." I even find myself using buzzwords sometimes at the urging of those who say that these words "legitimize" the work that I do. A rut can be called a rut or it can also be called... comfort zones or boundaries. Hey, it could even be called "buzzwords." But, let's call it what it is... It is just a rut, plain and simple. It is time to reexamine the ruts and determine -- are they there because it is the best way or because it is the way we've always done it? Although it is so important to remember that excellence should always be the goal... we can have students excellently learn how to sew a straight seam in a dress when indeed it is unlikely that in today's society that they will have to or that is necessary. I got frustrated the other day as I was looking over a course offering by our local RESA -- it was on differentiated instruction... it held no mention of anything computer related... Nothing! It had ways to cut paper, make manipulatives, etc. and yet the greatest manipulative invented in the history of mankind was left out. The person who attended the course said, "Well, they just didn't have time for that. This was for real teachers." And that, Dean, is the rut! 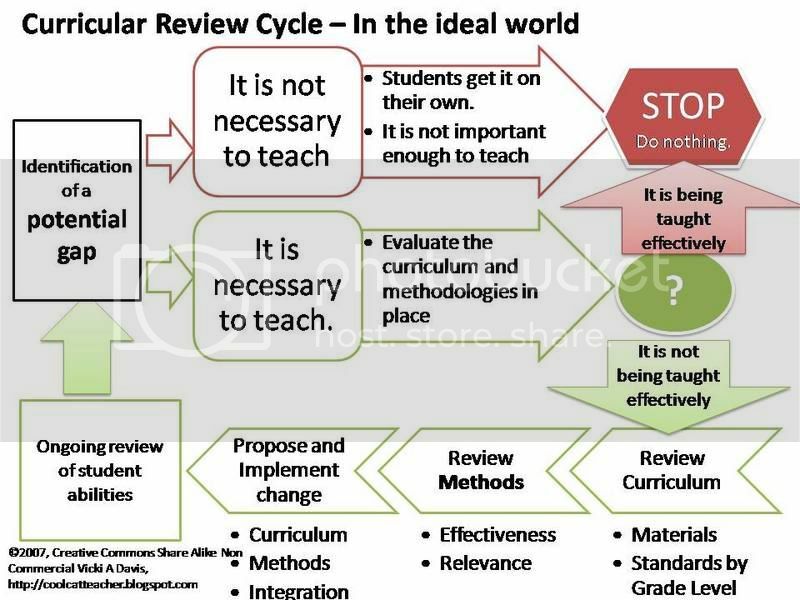 Real teachers and real schools need to be really relevant, really good at what they do, and need to really examine the content of what they are teaching. How can that be measured? Who can justify that day? What would I do if I were in a school that did not allow such "wasted" time? I would be a poorer teacher and my students would be worse off for it. It is time to scrape the roads, friends. Can your daughters picture at a car wash be used for an ad campaign? Creative commons will be put to test as will our interconnected world. A Dallas Family is suing Virgin Mobile's Australian ad campaign for inappropriately using a picture of their daughter snapped at a church car wash. The picture of 16-year-old Chang flashing a peace sign was taken at an April church car wash by Alison's youth counselor, who posted it that day on his Flickr page, according to Alison's brother, Damon. In the ad, Virgin Mobile printed one of its campaign slogans, "Dump your pen friend," over Alison's picture. This is a case study we will be using in my classes to talk about creative commons, ethics, and proper copyright. And if you follow the discussion over on Flickr about this -- you can see the light dawning about what creative commons really means. This was cited as "attribution only" but since the photographer wasn't attributed, the family seems to be using that argument. And, in this case, the photographer also didn't have the permission of the girl -- or did he? -- should she have been considered "talent" and compensated? Sometimes things happen that cause us to scratch our heads and say -- Hmmm? Breaking News-- I have also found a Flickr group discussing other images that are being used in this campaign. Setting Meetings: Doodle or ???? So many of us are collaborating with many time zones, that handy tools to help us set a meeting are so very useful. I cannot remember the name of a site that "someone" mentioned recently -- so I looked around and found Doodle. You go in and enter the days and time slots that you can do the meeting -- pick 4-5 days and several time slots -- then, e-mail it to others, including yourself. Then, they can fill out a poll and state which times they can attend. You are e-mailed when others fill out the poll. (Don't forget to fill it out yourself.) Then, you are able to see when you can have the meeting. IT is a very simple interface and you don't "sign up" literally -- it doesn't support time zone conversions, however, it is a pretty simple little tool. There is another out there right now that I think is flashier and I've seen it but I cannot remember it. PLEASE PLEASE let me know! Do you want to come to a meeting-- Fill out the Doodle! To see how it works -- if you would like to attend a session on working with Google Presentations as we all go in and "rehash" it -- look at it, fine tune the presentation, then follow this link and fill out when you can attend. I'll look at the schedule and let you know about a time that will work for as many as possible. In some ways, I feel like we're in the midst of the Berlin Wall coming down except this is the virtual wall that has divided us since time began. Many of us have been working with the Google presentations software -- during the 20 minutes I was in today -- at least 10 different people dropped in -- just to look at the presentation many of us have been working on. Claudia Ceraso has come up with a fascinating way to link a presentation page with Google Notebook and now we're editing that. We've also added a slide to our presentation of the things we'd like to see added. The chats in the presentations are no longer archivable and are disappearing. At first we thought it was in the settings but we think that it is down. Jennifer Wagner e-mailed me -- I checked twitter and saw folks going crazy about Google Presentations-- went in (as did many others) and played with it on my lunch break. Wanting to test the publish and chat features -- on a whim, I posted the link into twitter -- and the firestorm unleashed. Within the next bit at least 40 educators came in and out and over the course of 24 hours -- 40 editors made over 500 edits to the document. Claudia Ceraso created and shared a Google notebook that is being added to the presentation as hyperlinks to the slides. So, excuses are gone -- we have some great free tools that work together in ways we cannot comprehend. Sure if you like neato transitions you're not going to get that, however, if you have no budget and want a group global presentation -- this is the way to go! If we work on this presentation about Google Presentations -- then perhaps we can just USE IT when we want it. If the editors add to it as they find new things -- IT IS UPDATED. For notes and hyperlinks... add it to the Google Notebook. Tuesday, when I was in the chat it was surreal... I was in then Marshall Kirkpatrick came in... others tumbled in and then here comes one so many of us admire... Bernie Dodge -- who begins commenting on the Power of Twitter to unleash mobs. The list of those who entered and left is a veritable "who does it" list of educators. I cannot begin to digest or understand what just happened on Tuesday but it is truly one of the most pivotal experiences since I first began blogging or wiki-ing. I am passing along this e-mail. I thought those of you who teach writing might want a chance for your class to WIN FREE MOVIE TICKETS! Cool. I came across your Cool Cat Teacher blog and thought you and your readers/colleagues may be interested in a new classroom-edition online Writing Challenge from Answers.com. Classes can enter the Creative Writing Challenge as a collaborative effort and learn new vocabulary words while sharpening writing skills. The winning class will receive free movie tickets. Click here for full submission details. Entries are due by October 1, 2007. Looking forward! Let me know if you have any questions. So much going on today! Gotta run! Sometimes I come across efforts and innovation and I just have to say, "YES!" they get it! Who are the disruptive innovators? Here is their self introduction. "The vicarious star-studded glamour of the Hollywood era provides a backdrop for a professional development opportunity available to Saskatchewan teacher-librarians. Designed to engender a passion for reading and exploit the potential of a range of emerging technologies, Meet The Stars: Books & Web 2.0 explores all facets of the school library program - information literacy and the reading and literature programs. Meet The Stars is poised to become an overnight sensation in Saskatchewan libraries." 2) It doesn't teach technology for the sake of technology but rather, it uses technology to enhance enjoyment and learning of the subject matter. "Designed to engender a passion for reading and exploit the potential of a range of emerging technologies,"
Passion for reading AND technology enhanced discussion! It is not about the technology but what the technology DOES to enhance what we're already DOING! 3) Use of multiple senses. 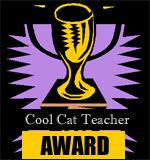 I love the voki's that the instructors have used to embed their voice into their introductory page. Widgets of all kinds are great enhancers to projects. The introduction page just gives me chills. Real people using technology to connect and improve their lives. This is an excellent model of best practice, in my opinion! Great job! They are light years ahead of others and it is amazing what they are doing! I hope you'll stop by their wiki and leave a comment on the discussion tab like I did! Wow! It is so important we call attention to those who are doing things RIGHT! Hat's off to Disruptive Innovators! You are blazing the trail! Flat Classroom 2.0 -- BIG ANNOUNCEMENT!! As a follow up to the award winning Flat Classroom project (see 2006 project), educators Julie Lindsay (Qatar Academy, Qatar), Vicki Davis (Westwood Schools, Camilla, GA USA), Barbara Stefanics (Vienna International School, Vienna, Austria), and John Turner, Presbyterian Ladies College, Melbourne, Australia) are announcing the official pre-planning of the Flat Classroom Project 2007 which will begin in October and conclude on November 30th, 2006. This year's project includes an intentional plan to include the six senses of the conceptual age as outlined by Daniel Pink in his book A Whole New Mind and an increased use of digital storytelling. Interested classrooms are invited to read the requirements and email flatclassroomproject@gmail.com. Participating classrooms will be announced on Tuesday, September 25th. Participating Classroom -- We wish we could take everyone but are looking for several other strategically placed classrooms with the competence to participate. Please contact us! Sounding Board (Peer review) -- Perhaps you have a classroom that would like to spend a day reviewing videos. This year's project will heavily rely on digital storytelling. E-mail us as well. We plan to add additional room in eluminate. Researchers - We are making the Ning open to researchers, expert advisors, and those who would like to more closely follow the project. A survey instrument is being designed currently. Judge - We are working on this element right now. Attendee - Attending a student summit or live elluminate meeting. This is exciting! We're looking forward to improving this project and building on what we've learned. In many ways it is a new project with Julie at a new school and I with a heavy workload this semester. My students from last year spoke at Rotary. The business people at the meeting were amazed and impressed. I was amazed and impressed because I know that the last project ended in mid May! Their retention was impressive and they retained so much! It is worthwhile because it is way to change my corner of the world. It not only teaches my subject very thoroughly but it also improves student global awareness, techno-personal skills and collaborative abilities. And one just needs to pick up any best seller to see the importance of those tools. Sharing Bookmarks: Easy Tips on How it is Done! I think that the del.icio.us is one of the great unharnessed resources and that every educator should use this service. Ryan Bretag has challenged many to share the last five bookmarks they have made. I would take it one step further. Those of you who subscribe to my RSS feed know that you get to see my bookmarks. 1) I signed up for a free Feedburner account. 2) After enabling the feed and previewing it. Click on Optimize and then LinkSplicer. Note: And if you do this, I also encourage adding feedflare which has some really cool new features. You can then specify the frequency. Now, this will mean directing your visitors to another feed. So, when I set this up (several months a go) here is how I did it. 2) Tell others on your blog that you are using the new feed and why -- ask them to subscribe to the new one. See what happens. I actually subscribe directly to Will Richardson's bookmarks and you can subscribe to mine directly as well. It is just so useful. You'll notice that I am now using hz08 a lot as one of my tags. That is because of my new involvement with the Horizon Project 2008. In order to share research among the advisory committee, any time we see something that we want to share with the other researchers, we use this simple tag. So many people are so desirous of keeping folksonomy that they forget that a great standard tag can facilitate communications remarkably well. So, if you do this, go over to delicious and bookmark your own bookmarks - tag it edubookmark -- and then, we can all go to this page and see bookmarks of other educators. What should be done about digital citizenship? My post about the need for more literacy instruction has created a virtual firestorm of response. Why is digital citizenship an issue? Eighty seven per cent (87%) of online users have at one time used the internet to carry out research on a scientific topic or concept and 40 million adults use the internet as their primary source of news and information about science. Not the library, but the Internet. "Eighty seven per cent (87%) of all youth between the ages of 12 and 17 use the internet. " These numbers show us that the effective literacy skills but particularly digital literacy holds the very future of society in its grip. The ability to form one's opinion and validate sources is the key. If students take the "first thing they come to" to determine their opinion, then we are sorely at the mercy of Google's algorithms and the determination of webmasters who desire to be heard. Understanding how to search, how to validate sources, and even how to use deep web resources is an essential part of being literate. So who decides what to do? In the Pew Research study, "A Typology of Information and Communication Technology Users"-- you'll find that they found that about 31% of American Adults are "Elite Tech Users." If you're reading this post, it is probably you. We are not teaching "mini-me's," we are teaching students. I would approximate a consistent number with what Pew finds, that at least a full 2/3rds come to me sorely lacking in these abilities. Although my goal is to teach students processes and frameworks that will turn them into what I call "intuitive learners," most are not there when they come to me. Our kids need to understand these things! Stephen Downes says, "Indeed, a person who reads a website and concludes that it's true, no matter what it says, is dangerously illiterate." Tom Hoffman says, "Check the source's references. Confirm information by looking at multiple sources. Read carefully." David Warlick says, "Instead of starting with a web page, displayed on the whiteboard, they [teachers] should start with Google, demonstrate how they found the page, the considerations and decisions they applied to select that page, and include in the presentation, the evidence that what's being presented is valuable...When we model authority, we shouldn't be surprised when students look for authority in every piece of information." Kristin Hokanson says, "At the upper level, kids need to be taught HOW to access credible sources...via data bases, advanced google searches and other good search strategies. If we don't, they will continue to go to the first sources available. " Gary Stager (from his comments over at David Warlick's blog) says, "Of course everyone should use multiple sources. The reason this is such a problem online is that it has rarely been done offline." Megan Golding says "I certainly feel like the majority of my students (4th through 12th grades) cannot find good information by searching Google. That's why I'm changing the way I teach "web research"." NJTech Teacher, says "It is VERY hard to teach children these skills. ..In my opinion, the kids get an assignment like this and they just want the assignment over! So, they grab what comes up first and run with it, no analysis involved (my son included)." Anonymous says, "This one of those things that I was shocked to see but after processing it I realized how true and common it is. ..I think we do a good job of stressing accurate sources when it comes to books, but it is different online, which is where most of the research our students are doing comes from. We need to make sure as educators we are holding our students and ourselves more accountable. " 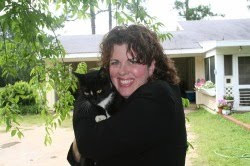 Sharon says: "I have been asking students to evaluate the web sites they find for years, using a variety of evaluation instruments and criteria. They didn't and still don't like to do it!" Profv says "First, many [students] have not developed the ability to "skim" for information... Secondly, students have trouble connecting information from multiple sources even up through high school." Through the controversy over my post, I still see an overall consensus that these things are important. I want to keep the focus on digital citizenship because that is why I wrote the post. Digital citizenship encompasses several things to me. Below is the matrix I recently developed in conjunction with the work I'm doing at my school. 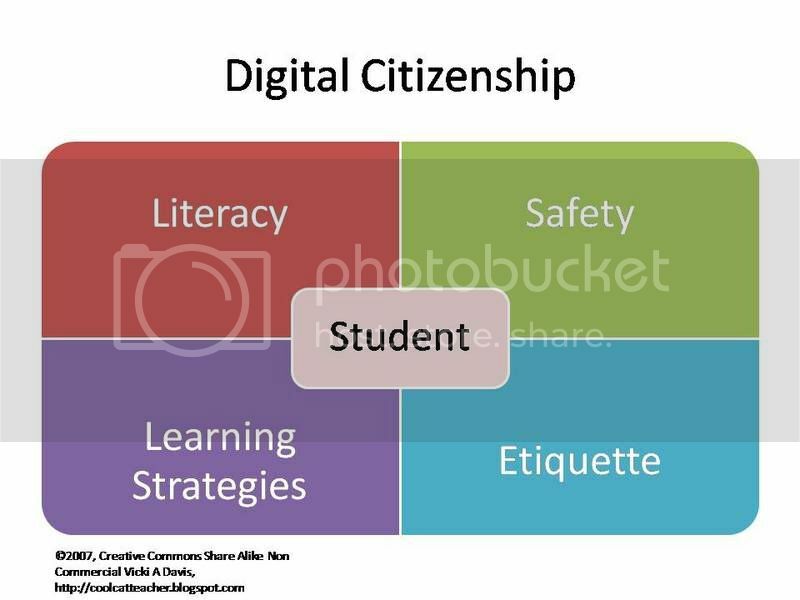 Digital citizenship is more than literacy, it is living safely, civilly, and effectively in our increasingly digital world. The focus here is that students are not where they need to be with the skills encompassed in digital citizenship. It is a process and cannot just be taught by one teacher one time and expect retention. It must permeate all subjects in all grade levels just like reading, for increasingly it is reading. Too many teachers talk about how students are coming to them vastly uneducated about researching, validating sources, and using multiple sources of information. Students are believing everything they read. Where is the skepticism? The investigation? The desire to double check things? It should be instilled as a part of what they learn, but specifically relating to Internet sources, thus the word digital. When there is a gap in student knowledge what should happen? Let's look at a few of these, that I feel were exhibited by some of the comments on my last post -- I am pulling from those comments. "I don't think that anyone, anywhere, is writing about casting kids - or adults, for that matter - adrift in a sea of information with no anchor or support. A kid can be 'not taught' and yet still not be left to 'figure out' thinks on their own." "Stephen Downes comment that kids can be "'not taught' and yet still not be left to 'figure out' things on their own." and with this disagree. We spend a ton of time emphasizing "healthy schools"--monitoring snacks that are served in the cafeteria, encouraging parents to discuss healthy alternatives for birthday treats, creating opportunities for students to participate in active games during recess. It is important to model these healthy choices. I went on to express that I would NEVER leave my kids in a kitchen full of all the food they can eat, with a big screen tv, nintendo, and a shelf of books and expect them to figure out that they will feel best if they eat healthy and read books...my kids would never figure out on their own that chicken with broccoli and book reading is better for them than video games, the Disney Channel washed down with Cheetos and soda with out some modeling and instruction early on. Kids need to be taught, teachers need to model so that kids can apply those skills when relevant. It is true with literacy as well." "We have to practice what we preach, and we have to practice it out loud! At the same time that we continue to use our textbooks (or what ever they evolve into), reference works, databases, and our own expertise, we should also bring in, at every opportunity, content and resources that we have found, evaluated, processed, and prepared for teaching and learning, and that we should include conversations about how we found it, evaluated, and processed it. 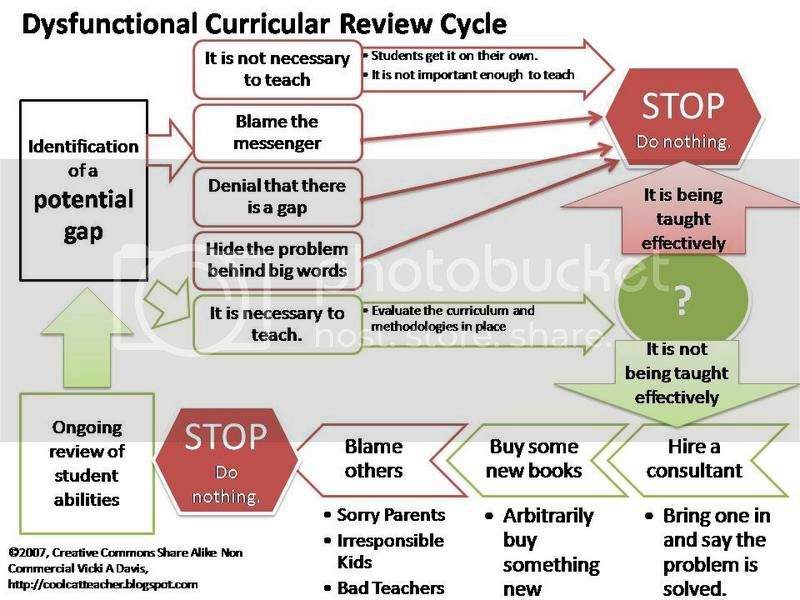 If the are seeing us, every day, asking the questions that are core to being literate today, then perhaps they will not only develop the skills of critical evaluation, but also the habits." Such things as verifying sources and basic literacy skills must intentionally be included in our curriculum at all levels. It should be modeled as part of what we teach as teachers and as parents. It should be encouraged in our social networks as it is in the Youth Voices network and in the sounding board that was part of the Horizon Project. It must become enmeshed in every part of education. "I don't see what makes this "digital literacy." Aside from a basic understanding of how to follow a hyperlink, the research skills I was taught 25 years are sufficient for assessing the quality of this source. Check the source's references. Confirm information by looking at multiple sources. Read carefully. What's the first thing my now retired mother covered in the first class she taught at Juniata Valley High School: evaluating sources." Yes, it was taught 25 years a go. It is not taught now like it needs to be. Tom programs, however, how many students still learn programming as they did 25 years a go -- that would be preposterous! And if you just use the literacy model from 25 years a go, you are again falling short! We must push ahead and improve. "This is a crucial problem for us in education, equipping our students with the skills to critically evaluate the information that they encounter. It is probably the most frequent complaint that I hear from educators about the Internet, as they try to teach that which their students must learn." "Hey, we've got a problem here. Our digital literacy skills are sorely lacking EVERYWHERE. We've got to do a better job! All of us, me included!" We need practical review of this problem. I want to see researchers looking at what is being taught and see some trends in digital citizenship skills of students including the literacy component but also the others. The point here is digital literacy, not what happened on 9/11 ,but verification of sources and making up one's own mind and having the process in place to do that. Not centering around what a teacher thinks, but rather a sound way to make decisions that is not flawed by accepting what one reads just because the website is pretty. "CNN (a reputable news source) ran a story today about the mysterious jet seen flying over the White House during the attacks of 9-11-01. White House correspondent John King narrated the report. What would happen if a student decided to include speculation about the mystery jet for their school 9/11 assignment?" "I think that CNN has veracity, I think that the first site he [my son] came to did not. We could probably debate my conclusions forever. Let’s keep the focus on digital literacy. I do not advocate mind control or self imposition of my own opinion. I advocate verification of sources." We all seem to agree that this is important. And if we have a suspicion that we aren't teaching it appropriately, we should look into it if we care about education! Prove to me that the majority of kids are effective digital citizens and I'll be quiet. Most of us teaching these skills know we are islands. Insulting me in this case (or my son or his teacher) is really like a basketball player going after a commentator because the commentator is reporting disfavorably about what is happening on the court. I'm reporting things as I see them. I don't get out much! I love my classroom and family and when I first got in the business world, I was traveling the country on a weekly basis working with cell phone markets. I've seen a lot and really love my home... the life of those who travel and do conferences is not really for me. However, there are a few things that are currently on my calendar, and if you read this blog and are going to be there, I hope you'll come by and say hello. Wiki Workshop beginning at 2:30 pm. 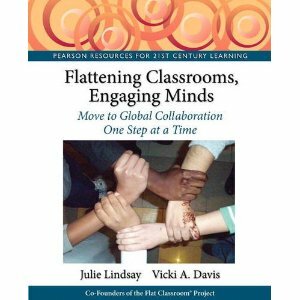 Unleash the powerful cooperative learning environment of wikis in your classroom. Learn how to use, assess, and coordinate a wiki project. Learn how to integrate a wiki with your blog and the strategies for effective peer review. Columbus, GA - 9 am - 3 pm - I will be doing an all day seminar sharing what my students and I are doing including our integration of strategies incorporated this year from Daniel Pink's book A Whole New Mind. PLU's issued. There is one more conference that I'm working on and of course NECC but we won't know about those proposals for a bit. I hope if you're somewhere close, you'll consider coming to these events. The EdTechConnect event is free, however the others do have a fee. Just remember, each Tuesday night come on over to edtechtalk for Wow2 and that is free too! Really, the happiest place for me is right here. Teaching, being a Mom, and blogging it all. I've received dozens of invites in the last week to join Quechup. It is really a problem when companies harvest your e-mail and send out messages without asking your permission. There should be ethics here and it is a growing problem. It took an e-mail from Lucy Gray to point out the great post by Wesley Fryer on this spam scam. And remember, we need to increasingly protect ourselves and our information from those who do not have the ethics to do that as a company. They may profit in the short term but they are just nailing up their coffin in the long run. What are you doing to connect globally? Tonight on Wow2, we're taking a different approach and discussing global connections in classrooms. If you're connecting globally, please stop by the Wow2 wiki and share what you're doing -- we're going to select some (or all ) of them to read tonight. When my son brought out his report on 9/11 facts, I was again reminded of how important it is to teach digital literacy. You see, when he typed 9/11 facts -- he found a conspiracy theory website(s) and came out of it thinking someone had bombed the building. Yes, he is in seventh grade, and Yes, I've talked so much with him about verifying sources, however, kids so often think if it is "on" Google that it is right. In fact, Google doesn't verify for veracity but kids often think so. Just another practical reason for teaching digital citizenship. We have practical real things that need to be done in classrooms around the world. And while many debate the theories and thoughts about what is happening, as a teacher and mother I know that our global society has fundamentally changed. There are real trails to be blazed here by those who understand those changes and can leave the hype and acronyms behind to civilize this new digital society with citizens who have discernment and civility. With the industrial revolution came problems, long factory hours, child labor, and things that did not need to happen. It took time to sort out and civilize factories around the world, and still, there are sweat shops. We would never leave kids on their own to "figure out" math or literature but we know that in order to speed their learning, we should educate them on the principles that work. Likewise, leaving kids to "figure out" effective digital citizenship is equally preposterous. As I read the blogosphere, I get frustrated. We have practical things to do and many theorists are arguing semantics and theory ... and many of those have never set foot in a classroom, I would think. Let's work towards digital citizenship instruction for every student! Let's build bridges that the society of our future can walk across. In addition to setting up a backchannel this year, I have a goal to make sure that every class I teach has a global connection project. With Business Week predicting that 38% of us will be on a first name basis with someone in India in 10 years -- I believe that teaching students effective Techno-personal skills is more important than ever. Connecting is not just a cutsie project any more, it is an imperative. Why are Technopersonal skills different than Interpersonal? This is my plan (thus far) for this year. Each selection has a pedagogically relevant, curricular reason for its selection. It is not just about using technology or picking something cool or fun, it is about an intentional, planned, well thought out project or forum for a specific purpose. Remember this when you pick your connection project. Here is what I'm doing. I hope you'll share what you're doing in the comments. This is a great walled location to start students. After a while, we give parents the password to let them communicate. This is handed off to the sixth grade teacher the next year for use in English. I make it public this year and allow others to see and comment. I encourage students to post and comment on other blogs from around the country. I am SOOO excited about joining this amazing collaborative which kicks off this week and there is room for you! I am extremely impressed with the openness, professionalism, and wisdom of the teachers who have started Youth Voices. We'll be blogging about the Flat Classroom project later during the week. These projects are founded on fundamental principles of teaching students global collaboration skills, cultural awareness, and immersion in creating projects about and experiencing the trends that are shaping our world today. I believe that students emerging from these rigorous projects are ready for challenging internet-enabled learning environments and a corporate environment that is in a constant state of flux. I always tell my students that there are only two types of people as it relates to change -- victims and victors. I want them to understand, accept, and profit from change. This is my elective course for seniors and I'm so excited about our participation in the University of Michigan's Arab-Israeli Conflict Simulation with super-expert Jeffrey Stanzler. This project is well thought out and sound and adequately supports the objectives of this course: multiple perspectives, creative thinking, diplomacy, and a thorough knowledge of the complexity socio-political happenings. This simulation has some profound scenarios in which the students must grapple with very complex political situations and are mentored by college students at the University of Michigan who are monitored and mentored by Dr. Stanzler and his associates. This is an incredible situation rich with teaching and cross pollination of knowledge of so many kinds and I believe a model for our future in education. We need to be harnessing the power of all segments of education creating such tandem learning projects in which each participant extracts the sweet nectar of learning in their own discipline. 1 - http://www.technospudprojects.com/ -- The Dr. Seuss project is going to be great. I know Jennifer, the person in charge very well -- she has these pedagogically sound projects down to a science. We had a teacher participate here last year and it was a great experience for the class! 3 - epals is another great place - http://www.epals.com/ -- They have teacher supervised global penpals which are great! It is such a neat project. You can see the projects here - http://www.epals.com/projects/ and you can specifically see for ages 6-11 (http://www.epals.com/projects/group1/) -- they have a great one on mythology. Education is the only entity that basically creates its own reality. Businesses that do not adapt go bankrupt. Education systems that do not adapt just keep on going. However, there are those of us (some, like myself who have come from business before going into teaching) see and understand the importance of moving ahead and while the theorists debate the efficacy of Web 2.0, we're producing students who will literally take a Byte out of their children's or grandchildren's proverbial lunch. Honestly, I could care less about the terminology, Web 2.0, or whatever. In fact, the Arab-Israeli debate is not really a Web 2.0 project, although Jeffrey and I connected via Web 2.0 networks. The fact is that the education that refuses to come to reality is going to render itself obsolete. If I hear one more person say "The kids today have changed," I'm going to scream. How about the problem being, that the kids have changed and "School today hasn't changed for 50+ years." I see the latter as the problem. It is about providing connecting, global experiences as part of an effective education and there may be multiple ways to do it. Currently my school does not have a 1:1 program, and although I wish it could be so, we're not there at this time. But I would put the technical knowledge that my students graduate with up against anyone, because I expressly teach them how to learn new software and how to operate in any environment with someone from any culture. 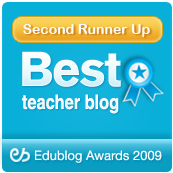 I have been focusing on reading the blogs of other teachers lately. The progressive, those who have useful things to share. For, there are those who have burst the seams of the traditional classroom and extruded a glimpse of all of the energy, enthusiasm for learning, and excellence that many pundits say is gone from today's education. Those are the ones I want to watch. I think that those who spend all of their time debating whether Web 2.0 is important are kind of like debating whether the point guard is important in basketball. I think that to focus on the technology is to get one's eye off the ball.. .the ball being the delivery of an excellent education that will promote and provide for the prosperity of our nation and world into the future. None of us wants to look at our child or student or grandchild and feel that something we have not done has caused irreparable harm to their future. I would argue that to ignore digital citizenship in this digital age is indeed to cause great harm... something us educators must never do. What will you do to connect your classroom?